Lesson 13 – It’s not hard to cook potatoes, right? It’s fish and shellfish this week. In preparation, Mike went surf-casting at Lake Ferry so I could practise gutting and filleting. He even had pilchards for bait which one of the locals had recommended. Luckily I purchased a Tarakihi from Moores just in case. Even though I got four ‘fillets’ off it, it was good practise. 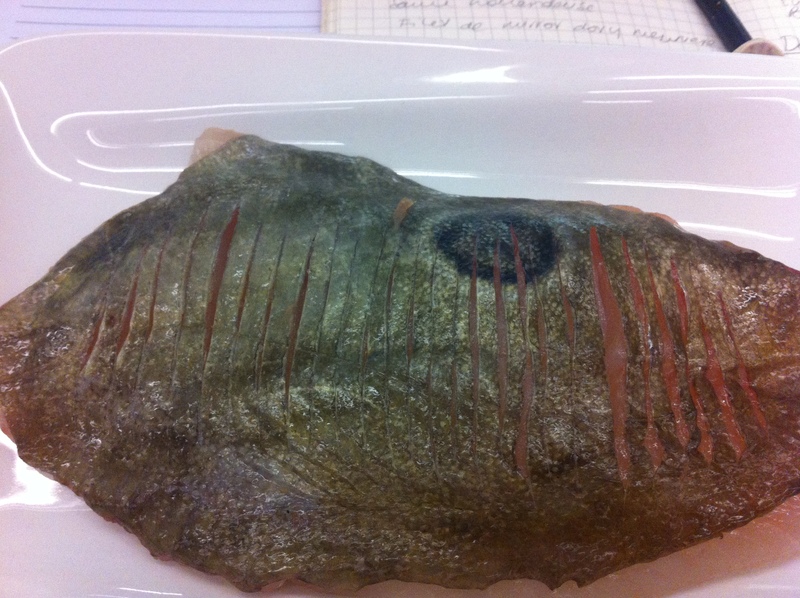 It takes a bit of skill to fillet and skin a fish with any sort of speed and only a few students have done it before. There’s a collective deep breathe as we approach the John Dory with knives drawn. You can hear a pin drop, the concentration is so great. Chef warns us that the barbs and fins are pretty nasty so we need to go with care. It’s surprisingly satisfying turning an ugly flat fish into deliciously edible morsels. We leave the skin on one fillet so we can see and taste the difference. John Dory ready to pan frying, skin on. 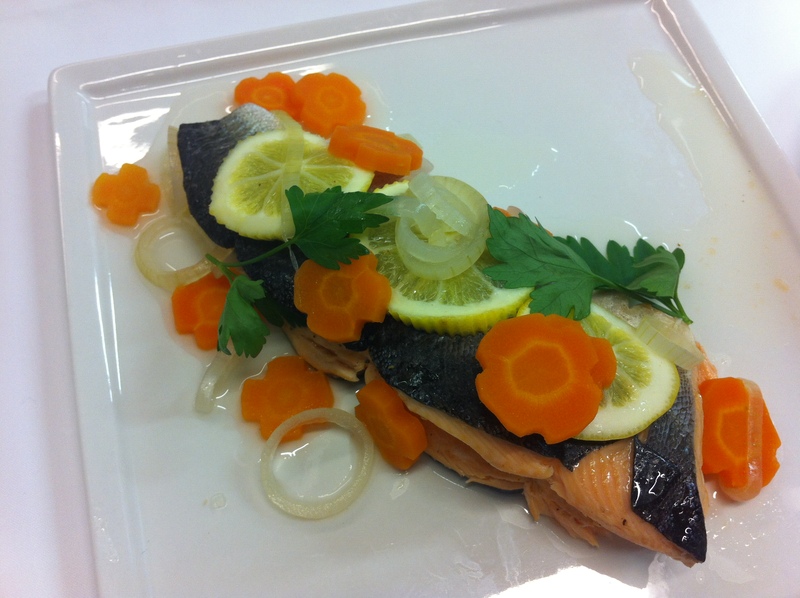 We also fillet a baby Twizel salmon, join and truss the fillets together and poach in a court bouillon – which is a combination of veges, herbs, water and vinegar. 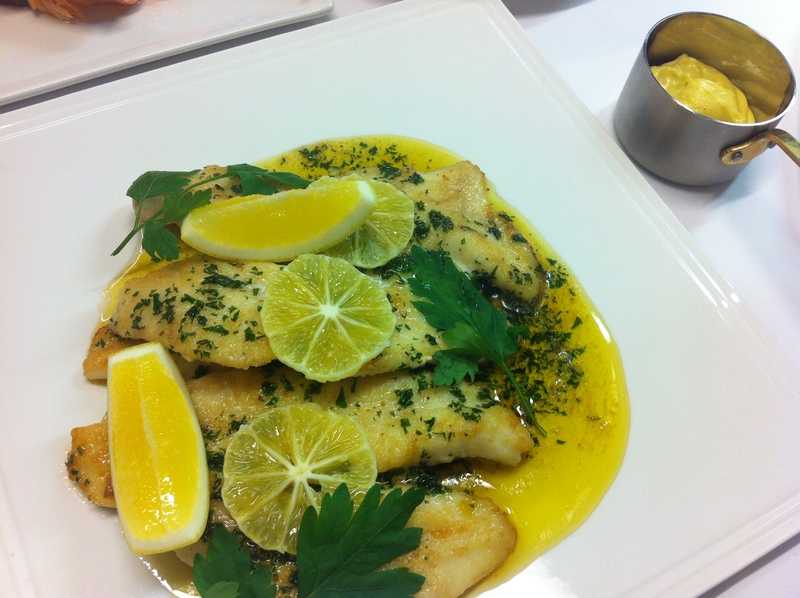 We serve the fish with turned baby potatoes and hollandaise sauce, both of which should be straight-forward. We’re doing the hollandaise by hand so that gives us plenty of control. The only thing we have to watch is that we don’t cook the eggs when we whisk them over the bain marie. You guessed it, I did. Chef showed me how to pull it back – but it was just in the nick of time. The turned potatoes are quite small so I have to watch that I don’t overcook them. Chef passes on a great tip today – add a large slice off the end of a lemon and it helps keeps the potatoes in shape. The salmon is poached, the Dory is pan fried golden brown, the hollandaise is ready and the spuds look done. I take my work up for assessment and it goes well until Chef cuts into a potato. Yep, for the first time in my life I have undercooked the potatoes (and served them to a Michelin star Chef). I find out later that several others committed the same atrocity. Why is it so easy at home to get the timing just right? Maybe it’s just the relentless pressure of the teaching kitchen where we are all trying to produce the perfect dish. « Lessons 11 and 12 – The week ends with a splash – literally! I thoroughly enjoy your reading your bloggs and your enthusiasm never falters .That looks simply delicious – just look at all that beautiful yellow liquid too!! Another great slice of your chef at school life. Love each and every installment. What’s a slightly undercooked potato between friends?